At Advanced Music Products, we strive to provide not only the highest quality plating available but also the best turnkey products in the industry. With over 55 years of plating experience and over 40 years of music industry experience ranging from professional musicians to master luthiers, we are the best source for all of your musical instrument product needs. All of our turnkey music components are carefully designed and produced for the best possible performance and tone that even the most discriminating ear would appreciate. From vintage inspired to thinking outside the box, you will find it all at A.M.P.! 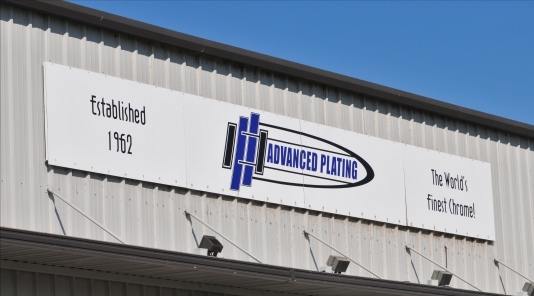 Advanced Music Products is a division of Advanced Plating, a chrome plating facility located at 1425 Cowan Court, Nashville, TN. Established in 1962 Advanced Plating set out to provide “The World’s Finest Chrome” specializing in the restoration of automotive brightwork. Today, Advanced Plating provides all types of finishes from copper, nickel, chrome, gold and powder coating for not only automotive products but anywhere from architectural ornamentation to music products. Within the facility is where Advanced Music Products emerged, a company dedicated to the design, engineering and manufacturing of various music components.